Our epic adventure begins. My daughter Anna and I flew into Moscow’s Domodedevo. We took the airport express into town, met my other daughter Josie, and from there took metro and then a short walk to the block of flats where she was staying. It is perhaps unfortunate that I am reading “1984” at present, for the Soviet-era block of flats resembles nothing so much as “Victory Mansions” at the start of Orwell’s book. We went out to dinner at a nearby Uzbeki restaurant. The music was jazz-funk covers of Nirvana, System of a Down, Avril Lavine, Boney M & Britney Spears. As Josie says, “c’est normale en Russe“. Our only day in Moscow began on a lovely sunny morning with the smell of cigarette smoke drifting up from the ground and into the open window of this our fifth floor room. After breakfast, we walked to Red Square, which was a good way along a wide and busy boulevard. Every few hundred yards there was a prominent sign offering US Dollar/Euro forex. We found that we could not walk between the Moscow river and the Kremlin, as preparations were underway for a marathon that afternoon. We saw squads of smart-shirted policemen walking up to take their posts, and some serious hard-looking men with dogs to sniff out drugs and explosives – though the dogs were not serious and were happy to play and scamper about. Russian – at least Moscow – roads are swept clean regularly. As we crossed the river three street cleaning lorries swept along, spraying water across the road in powerful jets. It is an effective and worthwhile public service in a hot climate. I have seen the same thing elsewhere in the world. We walked along the banks of the Moscow river, and crossed again to the Church of Christ Saviour, the largest Orthodox cathedral in the world. One phenomenon we saw a great deal of was wedding parties. On this sunny August Saturday, we saw not fewer than seven or eight wedding parties, with guests in their best dresses and suits, the bride in white, posing for photographs against some landmark or other. On that note, in Moscow nearly everyone – perhaps truer to say most women – dress smartly. Here you will see women in high heels and cocktail dresses popping out for a stroll in the park, ladies dressed fit for a nightclub going down to the shops to buy a loaf of bread. We had lunch in My My (pronounced “Moo Moo”), a reasonably priced fast food joint serving a fine selection of food. Our lunch – main courses, starters (including Russian “borscht” beetroot soup), bread and beers, cost R1538 which is about £38. 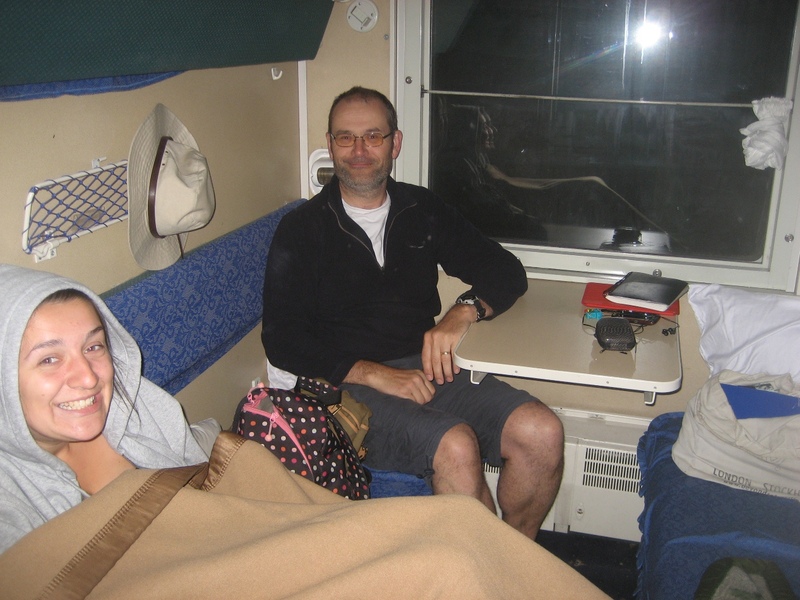 Near midnight we made or way to Yaroslavskaya station, and prepared to join one of the great trains of the world – train 020 from Moscow to Beijing. Twelve hours in and the first serious stop for the train whilst we are awake. Fifteen brief minutes on the platform. As we stood there, a train from St Petersburg drew in on its way to Perm. Not half so flashy as this train – much rougher looking sleeping accommodation. I took as good a nights sleep as ever I have had on this train bunk bed. We left Kirov and the afternoon wore on: the sheer size and scale of this country is slowly dawning upon us. Half past eight and we are at Perm. As we approached the city there was a lovely sunset. Perm is a vast city on the scale of Birmingham or Manchester. On an evening such as this with clear skies and sunshine, it looks great. Years ago I read a book by Craig Thomas, in which the action was set in a rough oil town in the Siberian Arctic, called Novy Urengoi. It was pleasing to see a long 18-coach train draw into the station, full of noisy and boisterous Russians, bound for just that place. 14:24 – East of Ishym, on an absolutely featureless flat plain. We can see some woods in the far distance. And here is a town – Mangut. I’ve downloaded and been trying to read E. F Gurdjieff’s “Meetings with remarkable men” which I first read in the late 1980’s. But much water has gone under the bridge since then, because today I find it pretentious and self-absorbed nonsense. For some reason I have vague memories of it being a worthwhile read. Also reading R.A Heinlein’s rare travelogue “Tramp Royale”, William Gibson’s “Count Zero” and John le Carre’s “Our kind of traitor”. In the next compartment there is a Russian family with a little toddler boy. His gurgling, yelling and playing has enlivened our day and provided much entertainment, and his crying has hardly disturbed us. Last night our relationship with the youth with whom we are sharing a compartment took a step forward when we offered him some wine.His name is Alexei and he is a motor mechanic from Irkutsk. 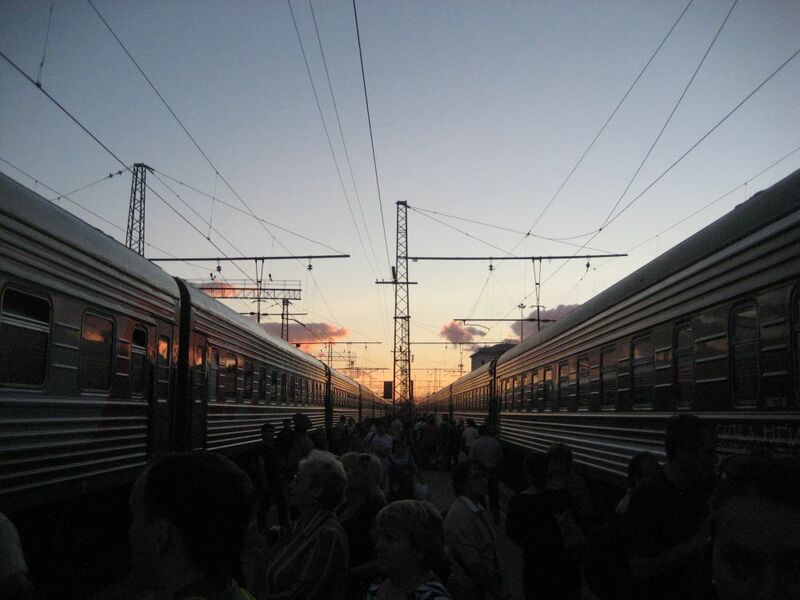 As had no English he had been completely unable to communicate with us – he talked to us in a desultory fashion through Josie, telling us that the train fare was a fifth of the air fare between Moscow and his home city. The train trundles on across the endless plain. Grass almost to the horizon, and occasional stands of trees. Four or five huge thunderheads tower up over the late afternoon landscape. Here is a town approaching – some old and disused buildings, sidings and goods yards and long rakes of wagons and freight cars. Flats and gardens, pylons and wires. Garden sheds and allotments jumbled together, grey weather-beaten wood. Thunder is in the air, but we are stuck in an air-conditioned train. Every four or five minutes, an east-bound goods train passes. A stop in the late evening at a modern looking station. We were getting hungry as the train made its way ant-like across the endless plain. Glad we were to find that this station had lots of little kiosks selling food and such. Here for the first time we saw the old ladies selling dried fish on the platform. We bought from a pleasant and cheerful babushka, some tomatoes, little cucumbers, a box of chicken noodles, a load of bread, a long curly sausage and three deep-fried pasties – for R500, about £10. The deep-fried pasties (basically doughnut mixture stuffed with egg, onion and potato) were so tasty I went back for more, buying two more with meat in, and a tin of beer. Total spend R700 – about £13.50. Not bad for an evening repast for three adults. At Barabinsk we were comprehensively assaulted by mosquitoes, and had to retreat to our compartment and shut the door. Nonetheless some mozzies managed to get in the compartment, and there were some bites. Back on the train I stubbed my toe on the heating duct whilst making my way down the corridor. I noticed blood – what seemed to be a reasonable sized cut on my middle right toe, and a badly damaged nail. Treating it took some doing, as it was bleeding like a stuck pig. Dressing a middle toe yourself is no easy matter. And the train rumbles on through the night. 20th August – what time is it? Surprising how comfortable is this bed. We did think that the train would be rougher than this. Yesterday’s smart purchase of xleb (bread) and kolbasa (sausage) went down very well for our late breakfast (well, lunch really) this morning. As we move eastwards, we have to keep rolling our watches onwards to keep up with the local time – but this has the effect that we go to bed later and get up later. Not jet lag but train lag. The weather today is cloudy and drear, and the land outside is no longer endless plain. Rather, there are gentle hills. Trees remain of course, the common factor of the Russian train journey. We have passed a series of picturesque little villages, with wooden houses, each with window frames painted sky blue. 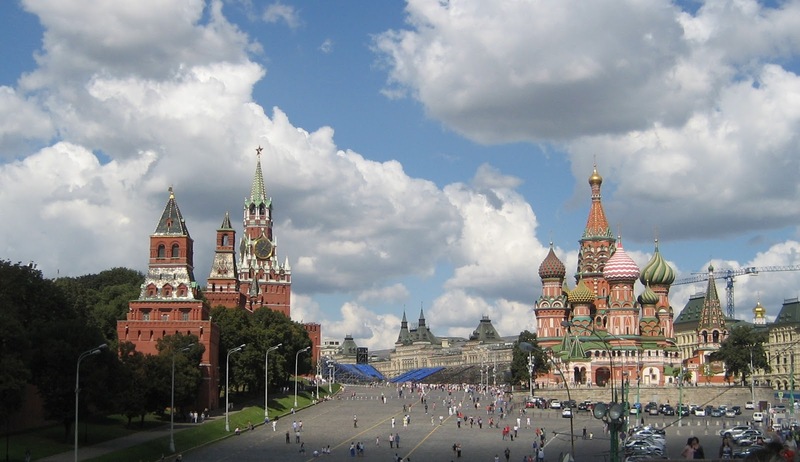 Sky blue seems to be a favourite colour in Russia, and they are fond of highly coloured buildings. Currently we lie to the west of Krasnoyarsk, in Western Siberia. At around 2.30pm local time we came to Krasnoyarsk, a big city set in rolling hills. All the usual stuff to be seen: marshalling yards, endless lines of goods trains, derelict sheds and worn Soviet-era industrial facilities. But this city, like all the others we have passed, does not bear the signs of urban decay or economic stagnation. Whilst there are many old and tired buildings, there is much that is new; much construction is clearly taking place. The station was the most big-city style station we had seen so far, with platform indicators, stairs and overbridge, endless announcements. Whilst there was no Victorian style train shed, the station reminded me of York, in that it was bustling with activity – men unloading brake vans, wheel tappers passing along the trains, policemen, passengers and tourists. Also, like York it is on the edge of railway yards and engine sheds, with lines of coaches and wagons and spare locomotives. As we took the fresh air outside the train, a suburban electric train comparable to those used in the UK pulled in. The low platform, the broad track gauge and the wide and large loading gauge conspired to make the train seem enormous compared to British trains. From the platform, the floor of the carriage was nearly head height. 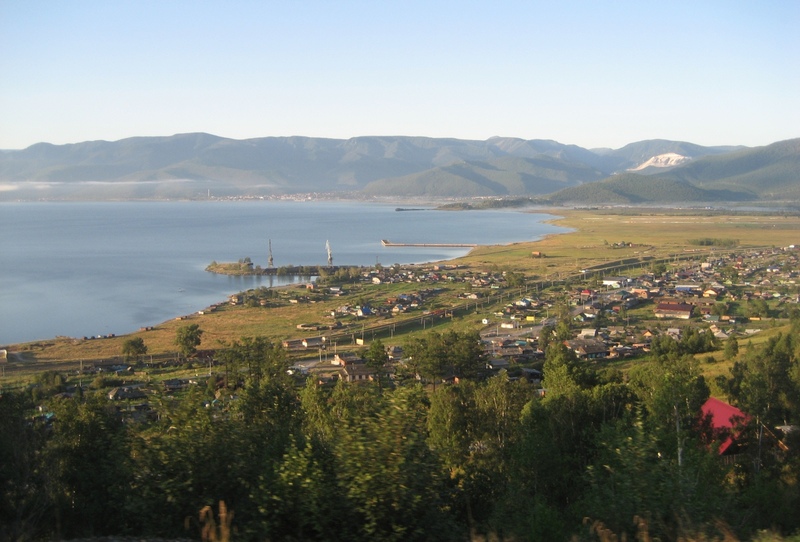 Beyond the station, some hills could be seen, and beyond that, there was the Yenisei river. One might compare it to the Seine at Bordeaux – but this is no estuary. This is a freshwater river a thousand miles or more from its mouth on the Arctic Ocean. And they are throwing another bridge across it. After the river, more hills – more serious tree-covered hills, with picturesque brightly painted chalets (“dacha”) and booths piled up the side of the hill. For an hour or so these hills continued, before the train emerged back onto a rolling plain. This is rich and fertile country – trees, grass, wild flowers. 5.15pm local – the train is crossing what can only be described, cliche though it is, as “rolling farmland”. Huge fields of wheat or other grain are draped across the landscape on both sides. There are still masses of trees, but they are in clumps, thicker towards the horizon. There are hayricks everywhere. I suspect that the railway itself is the centre of a corridor of cultivated land with mostly wilderness on either side. The weather has improved to a golden afternoon of hazy sunshine, though exactly what the local time is, I don’t know. A sunlit afternoon stop at this town. It is a modern station and one at which old ladies draw up carts and trolleys with wares to sell to passengers on passing trains. There are lots of heavy Russian savoury pastries, pancakes, potato cakes and pies; fruit juice, water and beer. As ever, all this buying and selling takes place in the valley between our train and another – very little of the surroundings can be seen from the platform. Beyond the sleepy station, it is just a quiet afternoon at a provincial town in the middle of nowhere. In the misty, cloudy morning we came to Irkutsk. It is Wednesday morning – we took train in Moscow at midnight on Saturday night. On the platform, a lady in her fifties held a sign with my name on it. Her name was Helen. She was very friendly and introduced herself to us, talking in Russian to Josie as we made our way to her car. In the car she switched to excellent and unaccented English to address us all. She took us to a “homestay”. And what a place – it was a well-appointed top floor flat, the home of a lady called Tanya, her husband, and their youngest daughter. It was clear from the furniture and bits and bobs lying around that there were absent grown-up children. We had separate rooms, which was a pleasant surprise. I had a little triangle shaped room off the kitchen, with pretty ladybird wallpaper, gold stars on the ceiling and good fittings and furniture. From the cafe we walked to the Angara river. A cool summer breeze was blowing as we explored an almost deserted holiday park called “Youth Island”. From there we worked our way along the river to the main bridge. The Angara river at this point is many hundreds of metres wide, much wider than the Thames at Westminster, and comparable with the Mersey at Runcorn or the Tyne at Wallsend. But this is a freshwater river thousands of miles from the sea! The sheer size of Russia can be seen in her rivers. At the main bridge we took photographs. It is a piece of Soviet-era civil engineering. You can see this because the bridge is best described as “wonky”. It was interesting to see that no-one stopped us taking photographs of the bridge – something that would have been somewhere between most unwise and completely impossible before 1990, even if a westerner had been able to visit Irkutsk back then. Feeling jaded, we worked our way back to the main square, and we sat in the park enjoying some refreshing fizzy drinks, as light rain fell. Thus perked up, we went to see if the main tourist information centre was open. A sign said that it was – but the door was unwelcomingly closed. We pushed it open and passed within. 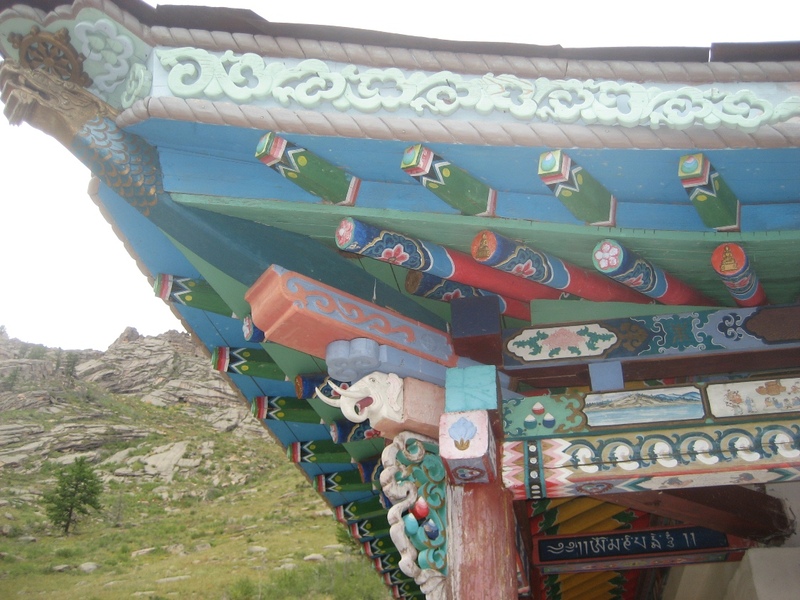 Two ladies – neither were ethnic Russians but clearly Asiatic or perhaps of Buryat descent – helped us with our enquiries. We were dispatched by tram to the main railway station; this journey was accomplished for the princely sum of R2 (perhaps 5p) per head. At the railway station we encountered for the first time and only time on our trip the infamous Russian bureaucracy. We were trying to organise and book a trip on the circum-Baikal railway. Visiting first a desk in a first floor hall painted in the most delicate shade of lime green (the Russians seem to be very fond of brightly coloured buildings both inside and out), we were passed from desk to desk by a series of unsmiling and unhelpful female clerks. We were given telephone numbers that did not work; we were referred back to a desk we had already been turned away from. It was the classic bureaucratic runaround. The only option was retreat to the city centre by tram. 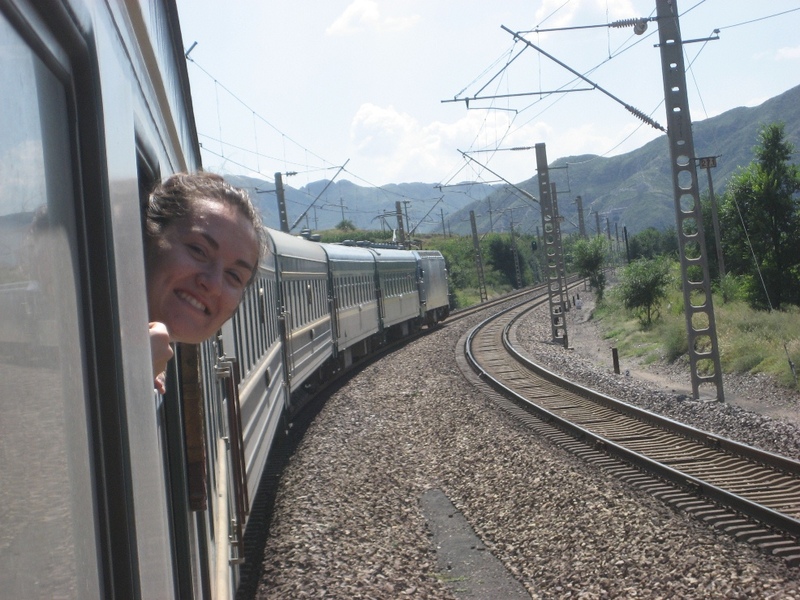 We found another travel agency, and in minutes Josie had negotiated purchase of a paper ticket entitling us to join a circum-Baikal railway tour on the Friday – the day after tomorrow. This could not have been accomplished without Josie, for the matter was conducted almost entirely in Russian. At this point an aside on Michael Bohm’s “The Russian Specific” is called for. This book is proving to be rivetting reading. It is an expose or candid description of the post-Soviet Russian psyche, written for business people proposing to work in Russia, and as such it is absolutely fascinating. For me as a libertarian, an individualist and a firm believer in personal responsibility, it makes for appalling reading. It could make me a Russophobe. We had a breakfast of champions; it was Russian pancakes (blinis) stuffed with cottage cheese and served with sour cream and jam. We had a polite conversation with mine hostess while we breakfasted, talking about our respective lives, through Josie as our translator. But it transpired that her English was very much better than she had initially let on. Then we took car with our guide Helen, who drove us out of town and onto a long straight road through the woods, which she said was still called “Eisenhower’s road” more than fifty years after it was built. It had been constructed for a planned visit to Irkutsk by the President of the United States – but the visit was cancelled after the Gary Powers U2 spy plane incident in 1960. We passed rows of huge detached houses, set back in the woods, all ostensibly built after the fall of the Soviet Union in 1991. Our guide Helen told us her story, of marriage, motherhood, divorce and making ends meet through the tough years of the early nineties. Originally a translator in the technical field of geology, she told us that she had become a trader of small things – mainly children’s and babies clothes – out of China. She told us that as a single mum she and her children had built a house by themselves, taking six years to do so. But the house had burnt down, and had not been insured. And who wants to buy a plot of land where a house has burnt down? That is unlucky. What struck me about the story was that she expressed little or no regret or bitterness at her poor luck or the circumstances and times in which she lived – but had pressed on regardless. I have met similar Russians – years ago I had a Russian colleague (who strangely enough bore an uncanny resemblance to the murderer Harold Shipman) who lost several hundred dollars out of the top pocket of his shirt, yet who bore his very serious loss with a stoicism and seeming indifference that was truly awe-inspiring to us, his western colleagues. At the landing stage on Baikal we were ushered onto a small speedboat along with Helen our guide and interpreter, and taken on a boat ride across the Lake. We saw derelict old tugs, a huge floating dry dock, and visited the “Shaman stone” at the outflow of the Angara river. Then we matched pace with the tourist train as it chugged along the side of the lake, through hills and curves and tunnels. We got out to walk through a railway tunnel (Russians don’t seem to bother fencing off railways anywhere) and saw where in 1944 an immense rock, tumbling down from on high, had dislodged a train and flung it into the depths of the lake. The wheels of the locomotive were still visible in the clear water; the carriages, with their grisly cargo of bones, deeper down in 80m of water. I found our guide’s commentary and interpretation somewhat tiresome. This was only because I was well aware of the cost in human life of the building of the Trans-Siberian railway, and I was well aware that every tunnel, cutting and embankment had been paid for in the lives of many slaves, irrespective of how wonderful an engineering achievement it might have been. But if I am fair, she was just telling the story, and giving her country and its history its due. The chicken legs arrived. Not one, not two, but three chicken legs. Each. We could not eat it all. Washed down with Coca-cola this meal cost R 880 – about £17. In the hot afternoon we looked at the market stalls, making a few souvenir purchases. Then we had beer at an almost deserted beach-side cafe. Because it was empty, this nearly ended in disaster when I burped loudly and openly – as you might after beer or Coca-cola – and there were some dirty looks from the nearby table of heavily armed Russian gangsters. Actually I made that bit up about them being heavily armed gangsters. But not the dirty looks. Later we took minibus back to Irkutsk. You just wander up to a minibus in the main square, and climb in. When it is full, the driver sets off for the city. Our minibus was lined with brown velour. The fare was about £2 for a ride of about an hour. In the night there was a tremendous thunderstorm, and the sound of the rain on a nearby poly-carbonate roof kept me awake for a while – though it is always nice to lie awake during a thunderstorm. In the drear and rainy morning we took taxi at 0745 to the railway station, a journey not enlivened, and lengthened considerably, by the arcane one-way systems of Irkutsk. 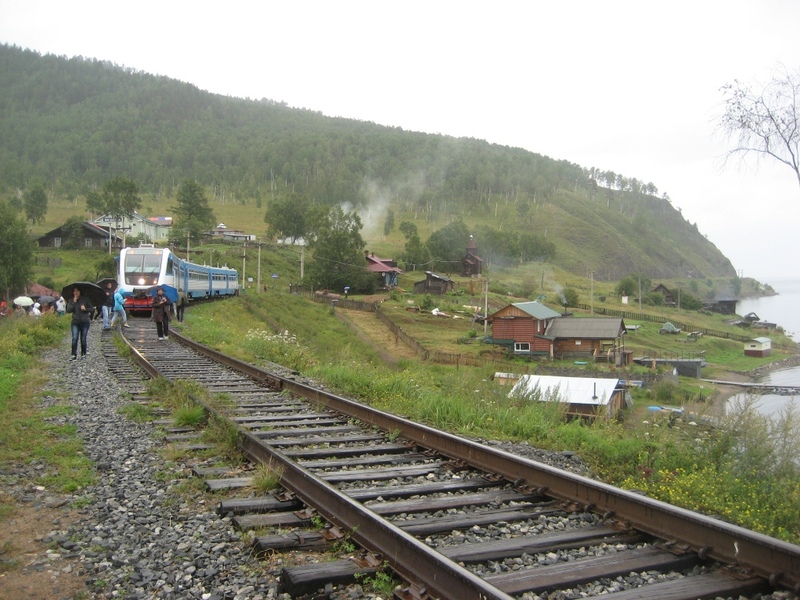 We joined a three car diesel train which was going to take us on a tour of the “Circum-Baikal” railway. In no sense does this railway go all the way round the lake, as the name implies, but merely follows a now by-passed route of the Trans-Siberian railway along the side of the lake. The original railway ran alongside the lake, and was a considerable engineering feat. However, rock falls and other difficulties caused the Soviets to build a better railway through the forests to the west of the lake – and the original route was abandoned, to become a lost tourist railway. 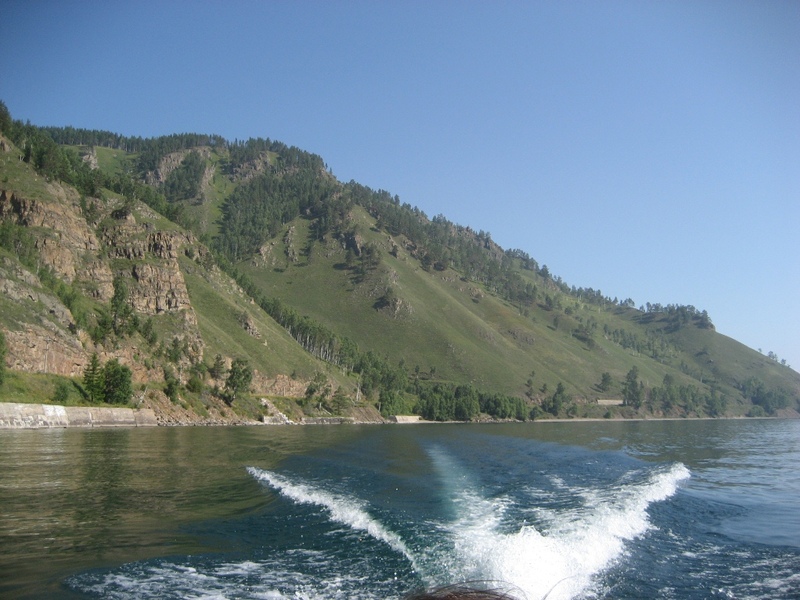 The first hour or so of the route followed the new railway, through the forests and valleys, and down a steep and curvy descent to the lake side, where the train stopped and reversed onto the old and lost tourist railway towards Port Baikal. This part was very scenic, though we were somewhat sleepy and the weather was grey and rainy. The little blue and white train inched its way along the branch at little more than walking pace, through tunnels and cuttings, past steep-sided tree-lined valleys and clusters of little dwelling houses. The weather improved slowly from quite heavy rain the morning, to merely dull at midday, to a sunny and cloudless afternoon at 4pm. The train stopped often at points of interest along the route, and everybody clambered down onto the tracks for a look round. For some of the older customers (a very many of whom were Japanese), clambering out of the train down onto the track was not easy without a platform, and use of a step-ladder had to made on occasion. Generally the points of interest were tunnels or viaducts or cuttings or places where there was scenery. A lady of a certain age, some kind of tour guide, spoke loudly and at great length in Russian throughout the journey, both on and off the train, using some kind of portable PA system when were on the tracks looking round. Around 1pm we stopped for lunch at a picturesque village by a headland. The line crossed a big river via a pretty viaduct and a modern concrete bridge, and here stood the obligatory Soviet-era 2-10-0 steam locomotive which you can see at railway stations all across Russia. At this stop the train crew refilled all the hot water containers, and ladies from the village sold minor food and drink items and a few souvenirs, including oddly flavoured vodka. As the afternoon wore on we grew more and more jaded and tired, even as the scenery and the weather improved. Visibility was good and we could even see the mountains on the other side of the lake, which we did not see on our boat trip the previous day. 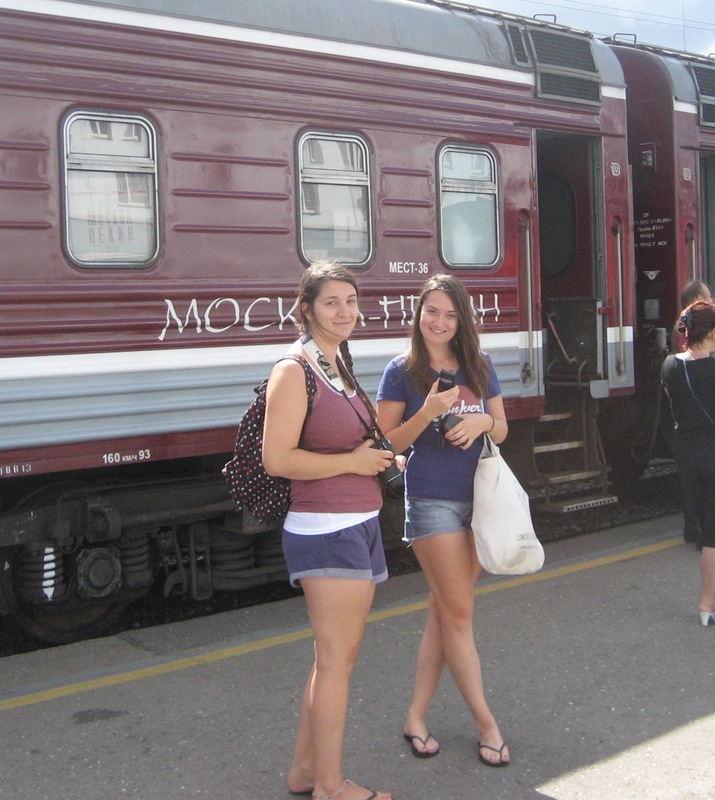 The train arrived at Port Baikal and we all got off, walking round to a quay to await a boat. In due course, a vessel called “Babuchkin” arrived. We nearly missed it. This happened because we were in a little shop buying cheese (R 44) and crisps. When we emerged it was to see a wall of Japanese tourists milling around waiting to get on the boat….hold on, they are NOT getting on the boat! They were in fact stood in front of a much smaller and dwindling crowd of people who were embarking. Phew, that was close. On the boat there was just time for the three of us to sit on some stairs and enjoy a brief meal of cheese, salami and tomatoes, cutting a 400g loaf into six thick slabs – the word “sandwich” is applicable only in the loosest sense. At Listvyanka we disembarked and it was a hot and cloudless afternoon – a far cry from that rainy morning. The wind was rising to occasional white horses as we sat on a wall eating crisps, waiting for the coach which would take us back to Irkutsk. At some god-awful hour of the morning (4.30a.m or sommat like that) we were taken to the station by our guide Helen, to join train no. 4 to Ulaan Baatar. You know that feeling you get when you wake up early to go on a long journey, and departure is delayed? Well that’s what happened here. The train was delayed by over an hour. We had a brief chat with a young Indian woman travelling with her husband and her friend before the train swept in at around 6a.m. It was coooold. The train was Chinese, with Chinese carriage attendants (provodniki) in uniforms and peaked caps. In our carriage the man was a friendly and cheerful fellow, which was a pleasant and refreshing change after the unsmiling Russians. The carriages were pretty much the same size as the Russian ones – that is, far longer, wider and more spacious than sleeper carriages in the UK. There are nine four berth compartments in each carriage, as well as an area for the provodniki to work and sleep. All carriages have a boiler or samovar so hot water is always available. There is a functional but basic lavatory at each end. The corridor is much wider than those on British trains, and the compartments reasonably spacious for four passengers. A short technical aside on the concept of “loading gauge” is called for. The track “gauge” is the distance between the rails. In most of the world it is “standard” gauge or 4 feet, eight and a half inches. The Russians (and also the Spanish) have to be different, and they use a broader track gauge of 5 feet. The more important “loading gauge” is a kind of measure of the cross-sectional area of the train – i.e how tall, long and wide a train can be without colliding with tunnels, bridges or trains going in the opposite direction on the other track. In most of the world this is quite generous, meaning that trains can be tall, wide and long. The UK has a very restrictive loading gauge – a consequence of having been the place where trains where invented in the first place. This means that British trains are very small and cramped – short, narrow and low – compared to Russian or Chinese trains. The coaches were not air-conditioned, to our joy, which meant we could open the windows. However, only with great difficulty could they be closed again! The carpets in the corridor and in the compartments were completely loose and hence lethal! That would not even be legal in the UK – ‘elf an safety. The scenery, as dawn came on, was truly remarkable. These few hours were more scenic than the entire four days of travel across the flat plains of Russia from Moscow to Irkutsk. After running through the woods and valleys, there was a switchback descent through curves to the lakeside, and then a long run along the side of Baikal. The weather was crystal clear morning, not a cloud in the sky, and the mountains could be seen on the far side of this immense lake. The rails here were not welded together so we were treated to a bumpy and comforting “clickety clack” train ride. Goods trains remained ubiquitous and continued to pass west-bound every five minutes. The stench of burning coal became apparent, and we found that the boilers like much else that is Chinese, are coal-fired. An undulating, hilly or even mountainous terrain. Though the river bottom is lush enough, the heights look dry and arid. It is a picturesque country and the weather remains lovely. We have left Ulaan Ude, the last serious town in Russia on our journey. Interesting to note that the only place where any of us were asked not to take pictures was at Ulaan Ude. It was very hot. 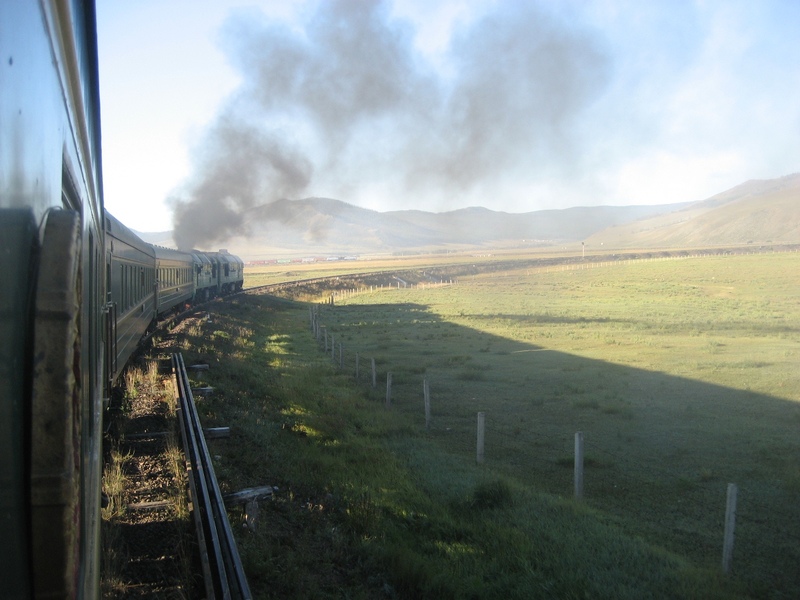 We have brancjhed off the electric Trans-Siberian railway for the single-track railway into Mongolia and onto Ulaan Baatar, and are now being hauled by a large articulated diesel locomotive, the after half of which is emitting clouds of what my son as a very small boy used to refer to as “dirty horrible smoke”. As the train climbs up the river valley, the scenery, the vegetation and the climate are changing. Up here, the temperate mixed woods of central and eastern Siberia, the endless grassy plains, the vast swathes of silver birch trees, have given way to a drier, scrubbier land reminiscent of the western United States. You could film a Western here. Here is a high town: some rows of sheds and some flats in the Soviet style. The surrounding vegetation, having changed from temperate woodland and green steppes to dry scrubby land, has g one green again as we have gained height. Now it is just grass. The temperature has dropped though, and there is 7/8 cloud. It is not as warm as I thought it would be here. From Irkutsk this morning has been as picturesque and varied a railway journey as any I have made anywhere in the world. I would never have thought, twenty-five years ago, that I might be able to visit Mongolia as easily as I might visit Peru or Australia. The changes brought about by the fall of the Soviet Union were profound and far-reaching. The Russian/Mongolian frontier was harmless. We were there for a few hours, and apart from not being allowed off the train and not being allowed to use the lavatories, there was little if any inconvenience. Policemen took our passports away and brought them back again. A variety of Customs officials from both nations shone torches into dark spaces and rummaged about. No-one was rude. No personal baggage was opened or inspected. Not long after we set off – just long enough to visit the loo, clean our cups and start on the wine (it was late evening) there was an emergency stop and people were observed running up and down on the tracks with torches. We thought this was great, because it meant we were holding up the train behind us, which had pulled in whilst we were at the border. The train behind us was a REALLY posh train full of folks much richer than us – the dining car was a sight to behold, all chandeliers and gold trim. We had a fitful night’s sleep on the train. I found it necessary to bed down fully dressed, as I was too tired to remain awake even though the Customs and passport formalities were not quite over. The bed on these Chinese trains is somewhat harder than that on the Russian ones. We arrived at Ulaan Baatar at around 6.30 am in the delicate light of early morning, 4/8 cloud, the sun just rising. Apart from a slightly worrying few minutes when I shut the compartment door and the handle fell off whilst we were locked inside, there was no hassle at all. We were met on the platform by a small lady bearing a sign entitled “Anna Hough”. She took us, along with two Englishmen (one of whom was called Nathaniel) to the Hotel Decor. It was only a couple of blocks from the station, and looked like quite a decent place. I had thought it would be a two-bit sleazy dive, a hostel for back-packers. But no; there was a proper hotel-style reception; a lift; a good en-suite and even tea making facilities. We might pay more in the UK for less! After freshening up we set off on this Sunday morning to look for breakfast. It was not yet 9 a.m. We had a long tramp along Peace Avenue, the main east-west road through the city, finding nowhere open at that early hour. Eventually we found a place open and sat down to good substantial western-style breakfasts, with juice and coffee. The bill was around 46000 of the local currency – about US$30. Enlivened and stimulated by our repast, we walked into the main square and took photographs. It grew hot. Then we went on a long and ultimately fruitless walk across some waste ground, a railway and a river, through some interminable residential developments, looking for the “Bogd winter palace”. We did not find it, and by now the sunshine and heat were growing baleful. We crossed back over the waste ground (some kind of flood plain) on a fine looking bridge, and stopped for iced coffee and Coca-cola. At this point another technical aside: both here and in Irkutsk they use electric trolley buses. In fact in Irkutsk trolley buses, trams and ordinary diesel-engined buses all use the same streets at the same time! After a brief sortie to get more cash out of the hole in the wall, we went to the Mongolian History Museum, primarily to shelter from the heat of early afternoon. From the museum – which was only mildly interesting apart a vast collection of brightly coloured national costumes, we went to a local restaurant recommended by the Lonely Planet Guide, for a very late lunch. “White Moon” or Luna Blanca is a vegan restaurant and far from it being right on and worthy, had really tasty food and great service. I was not convinced by the vegan cheese cake – ersatz cheese cake more like. The bill for jasmine tea, bottled water, green salad, three good lunches and the aforementioned cheese cake came to T 26000 – less than $30. The White Moon refers to Tsagaan Sar, Mongolia’s lunar New Year festival. After that very late lunch we strolled back to the Decor Hotel, getting lost briefly in a residential area. Interesting to note that we did not feel unwelcome, nor was the atmosphere ever edgy. 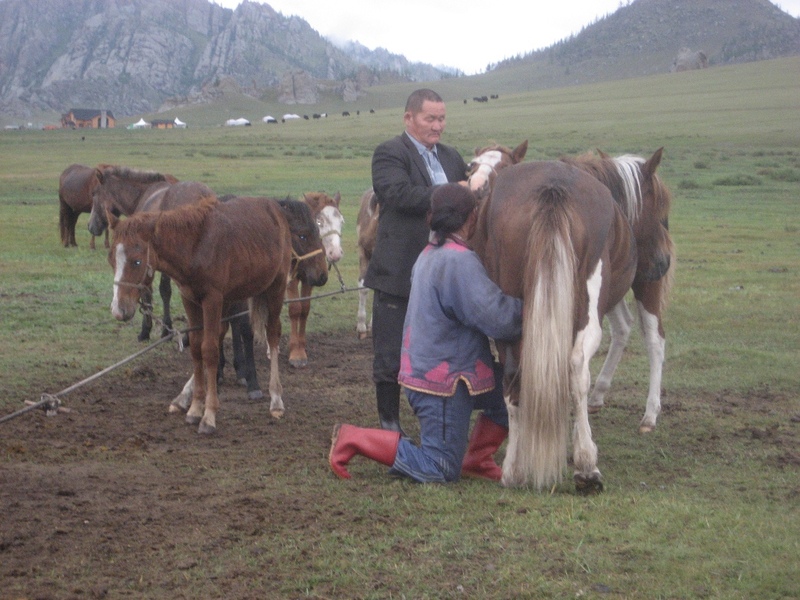 Mongolians are very friendly – most unlike Russians. They are generally quite good-looking people (having “good bone structure” as my daughter said with uncharacteristic delicacy of phrase). Because they are good looking, one thing leads to another, and there are LOADS of children and babies. In one day we saw many dozens of babes in arms, toddlers and small children, all doted on and attended by their mothers and their fathers. In fact, even as I write this, the sound of children playing in the back alleys behind the hotel drifts up to the open window of our room. We never felt oppressed or in any danger. No-one has so much as glared at us. I say that: the traffic is shocking and dreadful. There is no road discipline at junctions; drivers will mow pedestrians down even if they have right of way and the little green man is flashing. Crossing roads in Ulaan Baatar, you have to run for your life – not as a figure of speech, but in actuality. Our guide picked us up at 10 a.m on a rainy morning, after a reasonable breakfast of eggs, bread and what we think was luncheon meat. We set off in a Land Cruiser in what we were told would be a drive of some two hours to the Gorkhi-Terelj National Park. A third of that time was taken up with heavy traffic in Ulaan Baatar itself. We stopped on the way to see a guy who had two eagles and two vultures on perches. We were not entirely impressed. Though they were creatures of great wingspan, they did not look very happy. We left without pulling out our cameras. I can’t help thinking that our guide was not entirely pleased with that result. The next stop was to put a stone on a cairn near the entrance to the national park. We politely followed the “tradition” of walking three times round the cairn, before getting back into the vehicle and setting off again. There were lots of sheep and goats, yaks and cattle. The endless rolling hills of almost featureless grass were for me the most appealing and impressive part of the scenery. As we progressed into the national park the landscape became hillier and more rocky – and somehow less special. The Land Cruiser was not well and several times the driver had the bonnet up to peer inside at the engine – but it got us there in the end. A metalled road was being prepared, but for most of the way into the national park, there was no tarmac, just dirt tracks. These were easily passable with care, and we saw several large coaches lumbering along them. Such tracks would be impassable in England for six months of the year to anything other than 4WD vehicles. Little if any attempt was made to provide bridges or otherwise easier passage through muddy sections or to limit the routes taken by vehicles, so the dirt tracks spread out to make highly visible wide scars on the landscape. In this part of the park, close to the city, there was much ongoing tourist development, and the white gers are everywhere. Though gers are a traditional part of Mongolian nomad life, they are still large white circles, resembling fuel tanks or similar, and I found them obtrusive in quantity. Our camp was in a lightly wooded area of rocks, cliffs and boulders, at around 5000′ above sea level. Whilst pretty and note-worthy, you might see similar scenery in the USA or Mexico, in the High Atlas of Morocco or in Southern Africa, or in Spain or France. To be perfectly honest it could be anywhere temperate in the world. Only the ever-present lines and clusters of gers marked it as being in Central Asia. This part of the national park is being heavily developed; from my bed in the ger I can see a building site! The gers themselves are built on foundations with concrete paths between them. They are tents only in the strictest sense that the outermost material is canvas. They are not less permanent than any building of wood, brick or stone, and in principle and usage most closely resemble caravans on a fixed caravan site. The inside of the ger is glorious. Lino resembling wood block flooring; three very nice and comfortable beds; tables and stools; a sink (with a little tank of water and a mirror), and a stove for heating purposes, with a chimney pipe up to the middle of the roof. The colour scheme is orange, and the orange-painted spokes of the ger are decorated with highly detailed floral paintings. Lunch was served in a large cheerful circular room with tables round the outside near the windows. We were the only guests which was a little disconcerting. Lunch was a plate of meat in an excellent and piquant sauce. We thought the meat was beef. After lunch we set off to visit a Buddhist temple. This was perhaps 7 km distant along dreadful dirt roads. You might walk there and back in a short day from this ger camp – it would make an outstanding short day’s hillwalking. 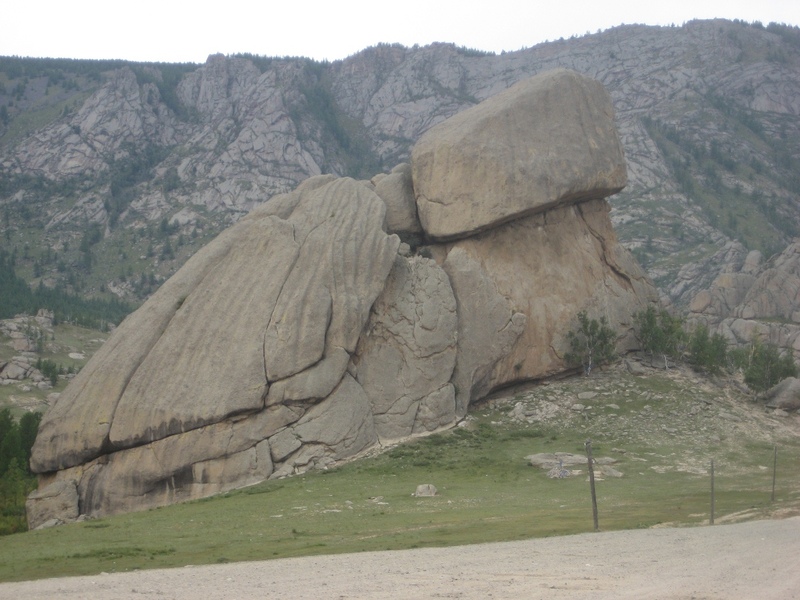 We stopped along the way at Turtle Rock, an immense landmark resembling said animal. We had to walk in to the temple up stairs, past hundreds of numbered slogans from Buddhism. The view opened out as we climbed, and was pretty spectacular. Half way up there was a pagoda with a big wheel. The pilgrim spins the wheel; the number at which it stops represents the slogan or proverb that the pilgrim has to meditate upon. The temple was quite remarkable. It was brightly coloured in primary shades with orange dominant. The patterns and detail in the painting, the use of shades of colour, the woodwork and the embroidery were nothing less than visually stunning, a real treat for the eyes. The ceiling was padded in gold and deep red material; gloriously worked renditions of Buddhist saints marched around the walls. Carpets were heaped on the floor. I did not feel it appropriate to take pictures, though I did feel it was not different in opulence from the great cathedrals of Western Europe. 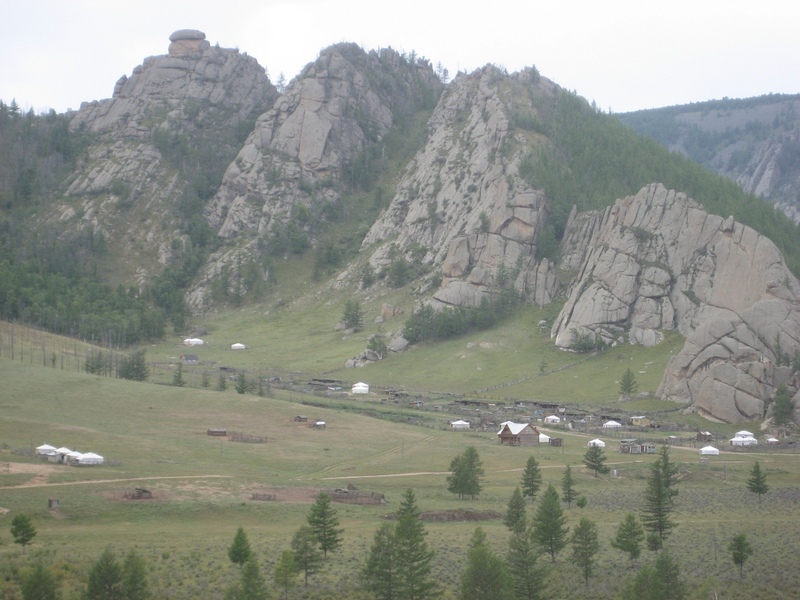 Of Buddhism itself I have less good to say: whilst Buddhists revere all life, I’m unimpressed with the Mongolian stewardship of the earth and life of this national park. There is litter everywhere – bottles, tinfoil, plastic bags. The dirt roads are ugly scars across the landscape, and the ger camps are obstrusive, resembling, to me, tank farms. After the temple we retreated to the ger camp for a rest, stopping along the way for an extended visit to the Turtle Rock. At the ger, a fire was lit, which quickly warmed the tent. I went for a walk to the top of the nearest hill, which was interesting, as it afforded good views away into slightly more unspoiled terrain. But it was cold up there in just a cotton shirt, and when I felt it starting to rain, I beat a retreat back to the ger. After supper, it started raining more seriously – though rain always sounds serious from inside a tent. Darkness fell quickly and early, catching us whilst we were out for a brief walk in the gloaming. It was full night by 8.30 p.m.
After breakfast we went for a walk up to a nearby col where there was a prominent and interesting rock. There were many strange and lovely plants and flowers to be seen. At the col, we observed a brown dog making his way quietly and purposefully over the pass. There was a great deal of litter in evidence – far more than you might expect at a similar mountainside location in the English Lake District, for example. We looked around for a little while up on the hillside, but rain started in earnest and soon drove us off the hill and back to shelter. I tried without success to light a fire, and the rain came down. After lunch – which was huge pieces of chicken in a garlicky, buttery sauce – the three of us, our guide and the driver drove in a 22 seater coach (the Land Cruiser having been deemed broken) to the home of a horse herder. This was a moving and very interesting experience. The inside of his ger was entirely like the one we had camped in – even to the point of the spokes being orange. We were informed that there were areas of a ger – we as guests sat at the southeast side (the door ALWAYS facing south, they told us). The north (or twelve o’clock from the door at six o’clock) was the most important or special part, and this was graced with a solid looking dresser, on which was perched a modern boom box. A valuable saddle was strung up on the wall at about 1 o’clock, whereas harnessing and other leather materials was behind us guests at about eight o’clock. A large bed was at three o’clock; in it, a boy child of about five lay fast asleep. All around were farm-sized plastic containers, and large metal bowls containing mares milk in various stages of being converted to other diary products. At about five o’ clock was a modern set of kitchen shelves with implements and utensils. The actual kitchen was by the stove, on the floor in front of the door. We were offered a kind of solid substance, being dried curds, and something that resembled (but was not) whipped cream, and also a small bowl of airag or fermented mares milk. This last was not as hard to drink as it sounds: it was cold, and very sour, and clearly moderately alcoholic. No harder to learn to like than any other alcoholic beverage such as beer, or whiskey, or Guinness. I mean, you’ve got to try, haven’t you? None of the substances had that smell that we in the West associate with rancid or unfresh milk products. The farmer looked like a cartoon farmer, dressed in a suit jacket, shirt, tracksuit bottoms and wellies. He had few if any teeth. He might have been in his fifties; he might have been older. Who can tell with these people? His wife looked very much younger, at least ten or fifteen years his junior judging by her appearance – she might have been 40; I wouldn’t have put her much older. Though she was ostensibly the mother of four children, she didn’t look it. After visiting with them briefly in their ger, we all went out to see them milking the mares. This was an interesting operation. The foal is brought along to cause the mare to “let down” her milk. The foal gets a few mouthfuls, and is then unceremoniously ejected, and the farmer’s wife moves in to milk the mare. For the most part, the mares stand uncomplaining. The little son, awake by this time, stood watching the operation in deep silence, before starting to wail. As we left, money changed hands, not particularly discreetly, as our lady guide paid the farmer’s wife for the privilege of us sharing her household for a few moments. Then, back to the bus and back to Ulaan Baatar in heavy rain. Later on, we wandered out from our hotel onto Peace Avenue, looking for somewhere to have dinner. We had it in our minds to look for an indian restaurant. It was raining, and the pavements and roads were flooded. Rivers of dirty brown water poured across the road at intersections; lakes and seas of mud covered whole sections of the footpath. This was no place for fancy shoes. After a good traipse, we spotted a restaurant called the Delhi Durbar, and in we went. We had an excellent meal. Two and a half beers, a Mango lassi, a plate of starters, rice, naan bread, chicken madras, a vindaloo (the real thing, not the rubbish that is served under the title of “vindaloo” in indian restaurants in the UK), chick peas and dahl, cost T 71000 or approximately £30. 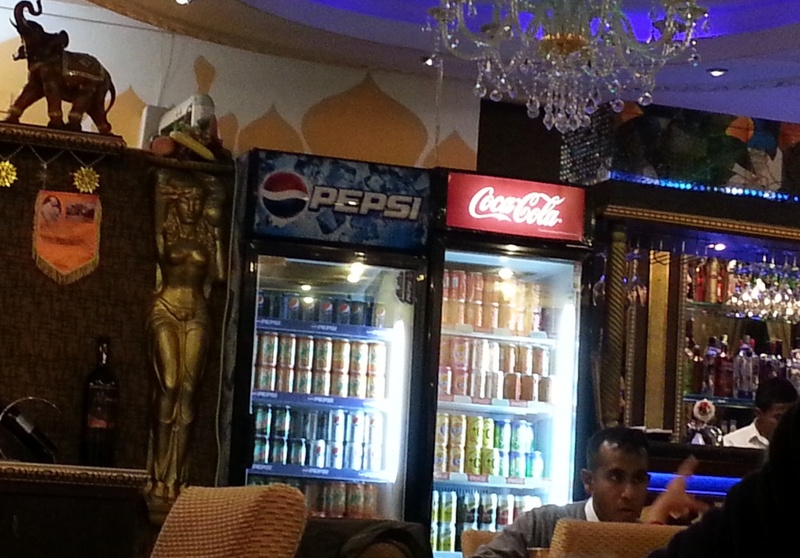 The restaurant was distinguished by having two fridges side by side, with adverts for BOTH kinds of a certain popular soft drink often associated with the United States. I post a photograph of it here for the record, because it is probably not allowed! Today was to have been a day when we could explore Ulaan Baatar as we saw fit. However, the weather was not fit for it. The rain that had started yesterday continued through the night and into today. It doesn’t rain but it pours here in Mongolia. I had not anticipated weather like this. Whilst I brought an umbrella with me against thunderstorms, I brought no raincoat, not thinking for a moment that it would rain like this – solidly for days on end – in August in central Asia. After a late breakfast we set off in the rain towards a monastery mentioned in the guide book. We had to step over puddles, and edge past rivers and streams of water at road junctions. At a main junction we were appalled to see a little lost puppy dog shivering with cold and wet. Even as we looked at the poor fellow, another dog appeared and made friends, and though that intersection will ever after be called in our minds the “Puppy dog intersection”, we trust that he was alright in the end. With only two umbrellas, we struggled to stay dry. The monastery was interesting enough, but it was busy with Buddhist monks doing Buddhist monk kind of things, so I didn’t feel it was appropriate to interrupt them or go into any of the sanctuaries, as we had at the temple on the mountainside the other day. 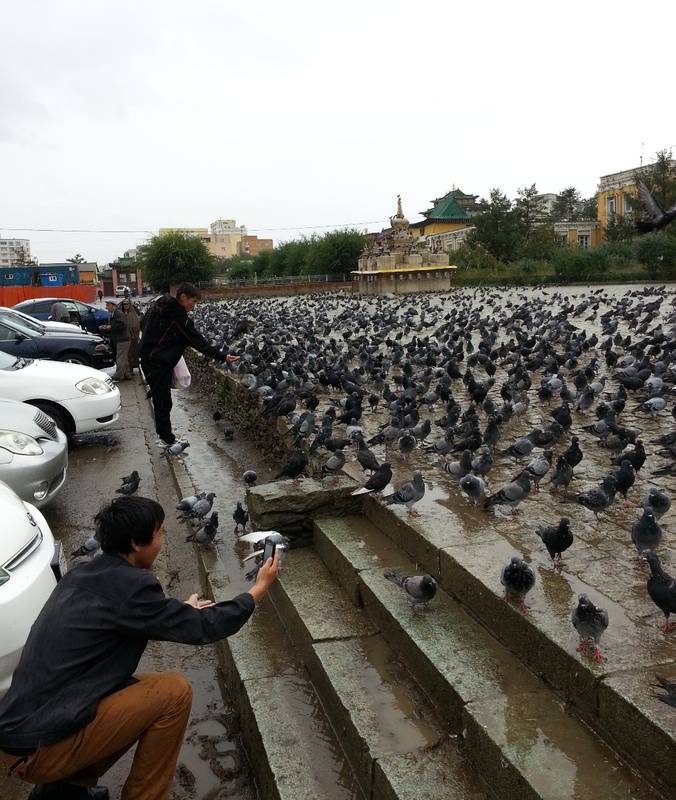 In some of the squares within the courts of the temple, there were many hundred pigeons, which many people were feeding. Personally I am with the Venetians here (feeding pigeons is banned in Venice). I think feeding pigeons is about on the same level as feeding foxes, rats, or seagulls. Or wasps: Why? The rain came down. From the monastery we retreated to a coffee shop for a latte and some cake – although what we inadvertently bought was a tuna slice. Arrggh. Then, a few hundred yards to the State Circus building, which proved to be, not a state circus of any kind, but a market of imported goods, mainly children’s clothes. The rain increased to a crescendo and we were trapped for some time in the foyer of this building, next to vendors of brightly striped donuts and cup-cakes with cheap synthetic butter-cream. From there, once the rain had abated to merely reasonably heavy rain, we hurried back to the State Department Store, five or more floors of wonder. We wandered round here for a long while, keeping out of the rain and checking out the prices. We had intended to visit a faraway market in another part of town – but the walk of 3km or more out there, and then 5 or 6 km back from there to the hotel, didn’t look quite so appealing in this driving rain. Over a lunch of burgers we decided to scrap that idea, and spent the afternoon instead in a fruitful browse of the local souvenir and tat shops to the east of the State Department Store on Peace Avenue. Then, after using up the remainder of our Mongolian currency on food for that evening and the train journey tomorrow, we returned to the hotel. Tuesday dawned sunny – the rain and clouds were gone and the sky was once again back to what we expect of central Asia in August – a vault of blue. Under cloudless skies and cold, we were driven back to the main station. Arriving, the first thing we saw was bus-loads of European tourists – older folk mostly – arriving to join the same train as us. On the platform, more Europeans, younger this time. In fact, nearly everyone we had seen on the last two trains was here waiting to join the train to Beijing. The passengers in the train are predominantly European and young. The train is full of tourists. Austrians, Italians, Ozzies, English, Indians, Czechs. The gilded youth of Europe and the west travelling around. The fourth berth in our compartment was taken by a pleasant Czech fellow called Michael who spoke English with a strong German accent. The city was soon behind us, replaced by firstly, grassy and featureless steppes, then, later, bluffs and cliffs and low hills. It was noticeable that the Mongolian railway was fenced off, whereas in Russia there was nothing to stop the general public wandering onto the tracks – and they did. It is a single track railway and the rails were not welded together, so we were treated once again to the clickety-clack sound, a sound that reminds me so much of the holidays of my childhood that it cannot but put me in a good mood. In fact, the sight of a diesel locomotive, even the smell of one or the sound of one passing in the distance, is enough to put me in a good mood, so much do I associate diesel trains with holidays. All of the trains have travelled at what we in the west might consider a sedate pace. Even the trains on the Trans Siberian rarely passed 60mph. 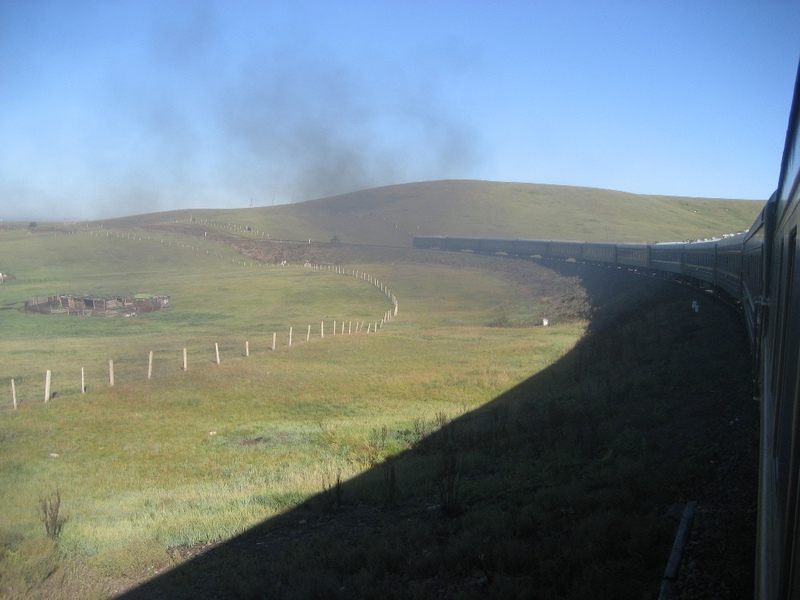 Here in Mongolia the train trundles at best, perhaps just clearing 50mph. We opened the compartment window – but could we close it? For a while we sat in the cold and shivered. but eventually – what a palaver – we called in the chinese provodniki, and these two uniformed gentlemen were unable to get the window shut. They just gave up and left us, suggesting by dumb show that we should instead lower the blind to keep the cold out. We chose not to notice this advice. Eventually, after herculean effort, the Czech guy Michael and myself got the window shut to within a centimetre of the top. 9:23 a.m: we just clattered through a hamlet with a little station, and the station mistress was stood, almost at the alert, on a little stand especially for the purpose, holding up a yellow flag as the train rumbled through. I can’t say “tore through” or “roared” or “thundered through” as these verbs, applied to trains in English, do imply a greater speed than the train is in fact making. The GPS records 85 km/h – a little over 50mph. 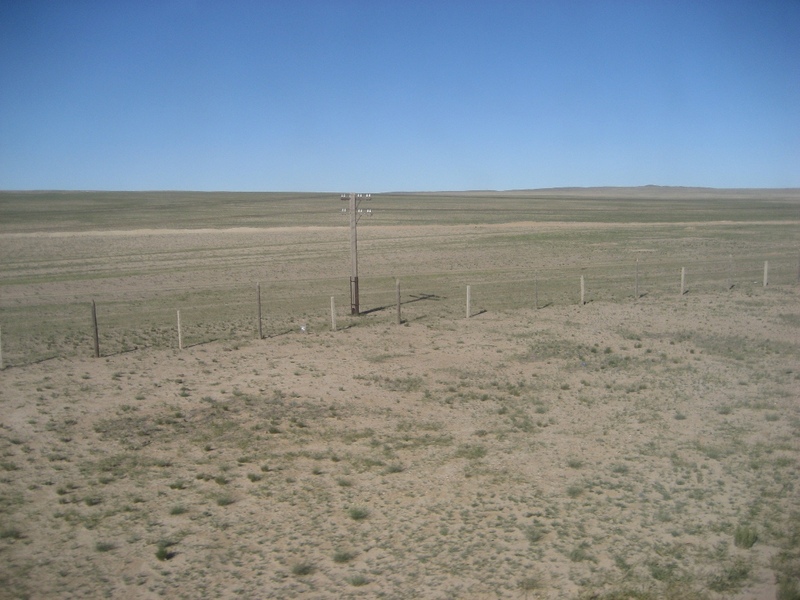 11 a.m: we are now on a featureless, though by no means flat, steppe. I imagine that much of Nebraska or Montana is similar. As time goes by land that was green glass and flat slowly rises to become more hilly. (“Hilly” in the sense that say, the Lincolnshire wolds are “hilly”). Also the land is drying out; vegetation is becoming less green and more scrub-like. We are around 4000′ above sea level. The cloudless skies of earlier in the morning have been replaced by 3/8 cover of fluffy “fair weather” clouds. At 11.45a.m we stopped at Чойр (“Choir” in English). 1 p.m: The land becomes drier still; sand is starting to become more common than grass. The fair weather clouds are becoming thinner and fewer. In the distance ahead, over the desert proper, there is no cloud at all. r to be an endless series of west-bound (in the sense of coming out of China into Mongolia) heavy articulated lorries. 4 p.m: we have passed Saynshand, where the train stopped briefly, and are now into the Gobi desert proper. The landscape appears to be about 3/4 sand and the vegetation is sparse and scrubby. There is not a cloud in the sky. The crossing of the border between Mongolia and China was harmless, although the Chinese officials were somewhat peremptory (the word I would prefer to use is “rude” but we are in a foreign land where it may be customary for public officials to behave as though they own the place. In dealing with officious and generally unnecessary public servants, particularly in the east, we play by their rules.) So I don’t really resent being told (not asked) to take my glasses off, and my daughter Anna could laugh off being told to stand up and made to say how old she was. What I object to is the principle that it is OK for public employees anywhere to be rude to private persons going about their lawful occasions. The bogie-changing sheds were interesting. The train was divided in two, and the two shorter parts shunted onto parallel tracks in a huge and ill-lit shed. The coaches were all disconnected from one another, and each one lifted up into the air, passengers and all, on hydraulic rams. 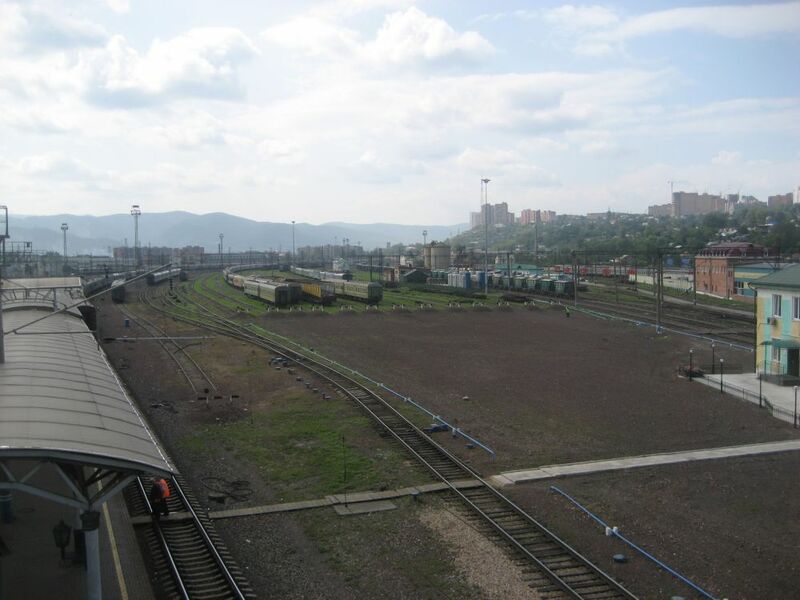 The Russian broad gauge bogies were pushed out the way, and new standard-gauge bogies rolled in to replace them. There was a great deal of clanking and banging, and shunting back and forth. The coach shook violently and juddered as it was pushed back and forth, though the part while we were in the air was peaceful enough. Horns and bells were going off at seemingly random intervals, and because it was dark, we had no sense of what was going on. The high point of the entire process seemed to be an impromptu ghost show laid on by people in a compartment in the section of the train opposite us. Much use was made of sheets and torches placed under chins, to the general merriment of all. 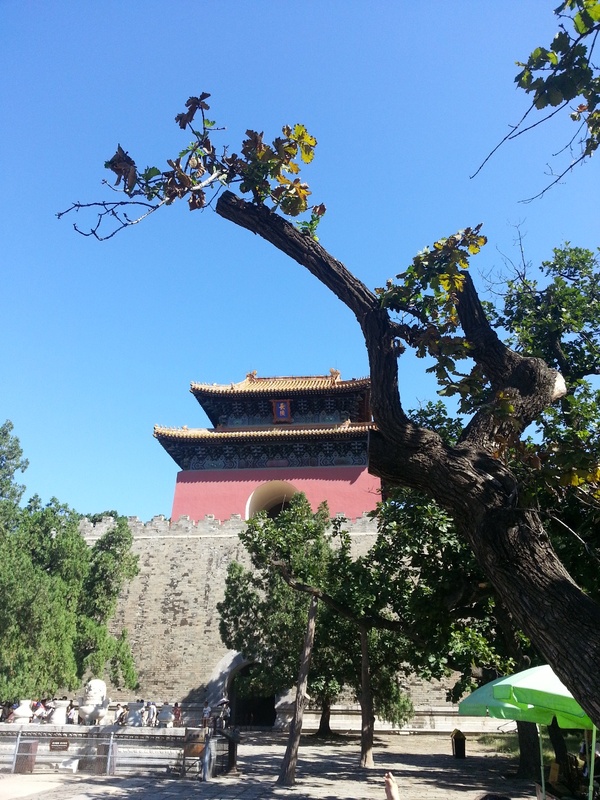 8a.m: Datong – it is a sunny morning we have woken up to. We have sped noiselessly through the night to this provincial city, and we are back in the realm of modern railways. Electric traction and continuous welded rail. The station is swept clean. Everything is tidy. There are uniformed officials everywhere. I got shouted at when I stepped over the “yellow line” at the edge of the platform. Passengers Must Not. It Is Forbidden. It Is An Offence To. terraced and cultivated to within an inch of it’s life: we have come through two countries where there is still much that is true wilderness. It’s doubtful that there has been any wilderness at all in eastern China for a thousand years, perhaps much longer. 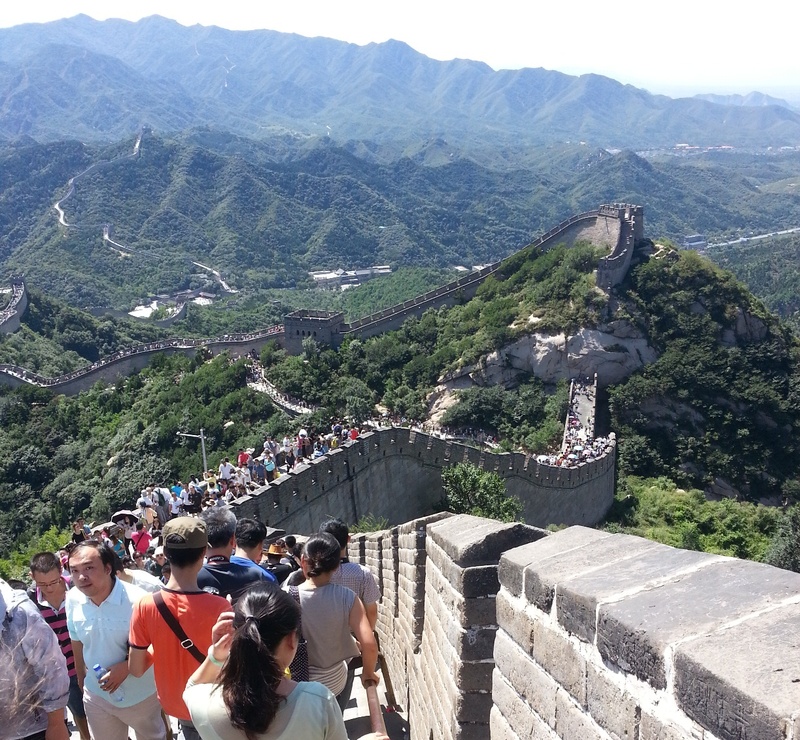 At 9.15a.m someone spotted their first glimpse of the Great Wall. 10.40 a.m: Zhang Jia Kou South station – it is hot and sunny. As the train passed through this city, we noticed several wide modern roads – but no traffic at all. 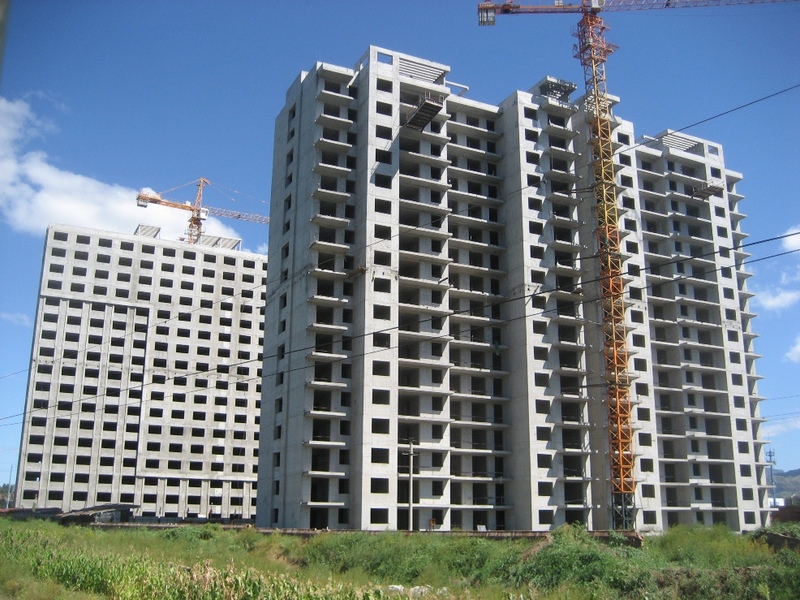 There is much that is new here – big office buildings, huge tower blocks of flats in long rows. In the hinterland the land rises up to mountains – we travel though mountains now all the way to Beijing. see it. In America, a thousand miles. Here? No-one. It is not a tourist attraction at all. The bottom and sides of the gorge are farmed in strips, and there are little orchards on the valley floor. The scenery is stupendous – this last few hours is more scenic than the entire six days on the train from Moscow put together. 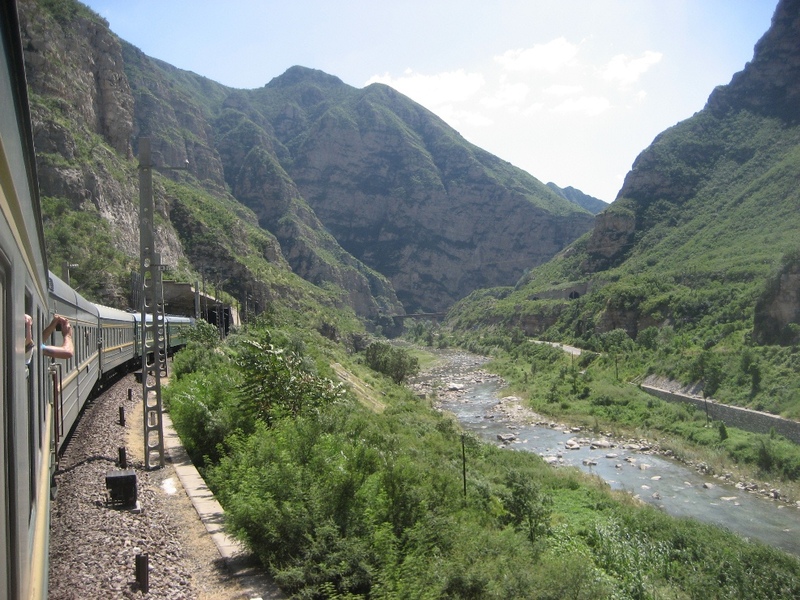 The railway ran out of the gorge, and the suburbs of Beijing were upon us. We think we know about large cities, but this one is a sprawling king amongst them. As the train drew nearer to the city centre, it grew much hotter, and the sound of cicadas was all around. It’s a street in a strange world. Maybe it’s the Third World. Maybe it’s his first time around. In the heat, we cached our bags in a heap, and the girls watched them whilst I crossed a nearby road via a footbridge, having spotted a bank with an ATM on the other side. We needed cash. Thus armed, I returned to the girls, and we found the entrance to the metro. The queue for the cash ticket machines was legendary – many hundreds of yards long, making the long and unwieldy queues seen for tube tickets at London terminii seem short by comparison. The queue for taxis was the same – hundreds of yards long. We had been approached by a tout offering illegal taxis, and we went back to him. We bargained with him and had him down from Y240 to Y150, though we might have been able to go further if I had kept my mouth shut and let my daughters do the bargaining. Haggling does not come naturally to me. But we bought that ride ‘cos I felt we should cut our losses – we were tired, hot, thirsty and hungry and at least 2km from our hostel through streets we knew nothing about, carrying heavy bags. Qian Men Hostel was cool and dark, an ensemble of several different buildings, linked by funky little courtyards with tables and benches for sitting and relaxing. It felt very much like a caravanserai. We had an adequate room with good beds; check-in was harmless (simply a matter of a few passport checks), and the showers were clean and ran hot. Can you ask for more? Freshened up, we set out for a walk, having been invited to dinner by the host family of Josie’s friend Emma. This was in an urban residential district, not in any sense “touristy”, and it was pleasing to see a “real” side to the city. People were coming back from work; kids were playing in the street. There were little corner shops and there were groups of old men sat outside on stools, enjoying the evening. This, to me, is worth much more than any great monument or “sight-seeing”. Earlier we had been sat at beer as darkness fell, and Emma had expressed some trepidation as to how her host family (a father, mother and little boy of 4) would deal with us. How would they take us? They were very keen to have us over, it seemed – but that fact itself was a slight concern. Our hostess was a lady in her early thirties; her son a typical four year old boy (that is, a bundle of energy, all over the place with toy guns that spark, never still for a moment). We sat on the settee in their spacious eighth floor apartment (living room, dining area, kitchen with no outside wall, two bathrooms and three bedrooms) and chatted over nibbles and drinks. Then her husband arrived home from work, changed, and introduced himself. English was in short supply, but enthusiasm, welcome and good cheer more than made up for the language barrier. Soon enough we were sat down at table for a delicious meal of home-cooked chinese food, and drinking a 2009 Bordeaux…out of shot glasses. Strong spirits also were served, and there were frequent toasts (and this practice is something that westerners coming to China are warned about). Mine host was gracious relaxed in this matter, however, and chose not to notice that I only sipped at the spirits rather than necked my glass every time he proposed a toast. After dinner there was more relaxed chat, whilst we were entertained by the antics of the 4-year old. Children in China don’t keep English hours, and there was no suggestion that it should soon be bedtime for the lad, as there might have been in the UK. The evening finished with some piano playing and some staged singing and demonstrations of musical skill from the little boy, of whom his parents clearly had high hopes. Tired, we made our excuses and went on our way. They were quite happy with that, well aware that we had had a long day of travelling. Whilst waiting outside at 6.30a.m, we’d managed to find street vendors selling breakfast – some deep-fried dough rather like the Spanish “churros”, though perhaps less sweet, and something else that proved to be very tasty; something that was a cross between an omelette and a wrap, with various fillings. We were picked up outside the hostel and were the first customers in 22-seater coach. The lady guide introduced herself and took our money. She was a young woman in her early twenties from a rural village in Manchuria, come to the big city to make her fortune. When we gave her money, she was less than impressed with the fact that we had booked the tour for only Y120/head; she said that the true price was Y300/head. She went to great lengths to tell us that we should not talk to her other customers about the lower price we had got, or else her day would all of a sudden take a turn for the worse. We did not find such discretion to be a hardship. The other customers were all collected from up-market hotels in a different part of town. There was an Australian man in his forties with his two teenage sons, who were stopping over in Beijing on a trip to Norway and other European destinations. There was a lone Chinese with his young son, and there was a Philipino family consisting of a pampered overweight brat of 10 or so and his immensely wealthy father and mother. Whilst the father and mother were harmless, the son had seen and done everything and was not afraid to tell anyone who wanted to listen all about it. To say that our Chinese lady guide spoke at great length would be putting it politely. Using a microphone and cranking the PA right up, she addressed us about everything conceivable along the route. Sat in the front seat I did not feel able to so much as look out of the window, much less quietly read my book; I had to keep my eyes fixed on her in a kind of show of fake interest. Being Chinese rather than European, any nuance of my body language indicating that I had no slight interest in her tedious and over-loud commentary would have completely eluded her. Our first stop was at the tombs of the Ming Emperors. This was a number of fine traditional chinese buildings set in gardens. Inside was one huge space with a giant statue of some king or other. The roof and walls were in solid wood; the roof beams must have been single trees, the pillars likewise, immense trunks, all of sandalwood. Overall it seemed to me that it was rather like what we might expect the inside of Solomon’s Temple to have looked like. A truly immense space created from some very clever wood engineering. Outside the sky was blue and clear, green tree-covered mountains all around. From the Ming tombs we went to what was billed as a “Jade factory”. It was nothing of the sort, simply being a large shop (the Chinese know well that a fool and his money are easily parted, though we managed to resist easily enough) with an even larger canteen or refectory behind it. It was enlivened only by the most wonderful globe in the foyer. This globe was over a metre across and made of all different kinds of semi-precious stones and jade. Each country was picked out in a different kind of material. Doubtless it too was for sale, and it would look great as the centre-piece in the foyer of some head offices, or perhaps a 5-star hotel. I could have looked at that globe for hours. While we were there, we were taken through the refectory (which was half full of noisy Chinese families) into a smaller and better appointed area, obviously for westerners. Here we enjoyed a very good Chinese lunch, although it seemed impossibly early, barely even noon. After lunch, a long drive through mountainous and scenic countryside to the Great Wall at Badaling. We were fast-tracked onto the cable car, and we were appalled by the queues of Chinese everywhere – at the top, at the bottom. Whilst the Great Wall was visually stunning, the sheer volume of Chinese tourists present meant that I found the whole experience somewhat unsettling to say the least. The only place I have ever visited that was anywhere near as busy was Venice. I’ll go back to Venice; I shan’t come here to Badaling again. The experience was compounded by the queue to get down again from the top – it was about forty minutes spent shuffling through a tunnel, which I didn’t find particularly enjoyable. After the Great Wall, we were driven back to the city to some form of private clinic, where we were going to be offered foot massages. It all looked a bit flaky to us, and as it was already 5pm and we were all feeling somewhat jaded and tired of our guide’s endless cheerful commentary, we politely told mine hostess that we would make our own way back home without foot massages.This we did without too much difficulty, taking first a cab and then a long and complex metro ride. Our final full day on holiday was spent relaxing – you can do too much on holiday, and end up needing a holiday to recover from your holiday. After a late start (before which I had spent a good while shaving off two weeks growth of beard), we strolled around in the alleys near the hostel. This was magical – a glimpse of the hidden real life of Beijing. Kids were making their way to school in droves. Initially we thought they were Scouts, until we realised that their red neckerchiefs were merely part of their school uniform. After some local souvenir shopping, we went to the Silk Street Market, which is a modern market on four or five floors, rather like the similar markets in Hong Kong and Singapore. Bargaining is essential here; every manner of goods is on sale. Each vendor will tug your arm as you go past, entreating you to deal with them, all sweetness and light until you start bargaining. Then their eyes turn hard and it’s no more Mr Nice Guy. “You hard man” they say, with no obvious irony. “I make no profit.” Yeah right. You need a while to get used to it – when they tried to sell me a “Rosetta Stone” CD for Russian language, for US$5, only then did I get a grasp of how inflated their marked prices were. Alas, bargaining is not in my nature. That evening, we went out for snacks with Emma’s host family. This was a great family occasion. The area to which we went must have been something like the equivalent of Brick Lane – alleyways and streets of restaurants, big and small. Some of the food we liked…some, less so. The hardest thing we did was pressing money on mine host: all the food we ate must have cost Y200 (about £20), and we know that their wages are lower than ours. Only after some persuasion and charm were we able to get him to accept some money towards the evening. Our holiday has been excellent. We were never in a bad place. We were never hassled by thieves, pick-pockets, officials or police. There was no trouble of any kind. As I said of Mongolia, no-one has so much as glared at us. To my surprise the Chinese section of the trip was the highlight. I thought it would be the tour through central Asia. But Beijing is superb – a magical place, so huge and full of variety, from great palaces and squares, sweeping boulevards, towers and skyscrapers, through to vendors selling tat out of brightly lit and garishly decorated shops, to back alleys where the real life of the city is conducted. We have seen uniformed school-children, each distinguished by a red neckerchief; babies aplenty, often dressed in the distinctive split trousers of the Orient; we have seen the true variety of Chinese physiognomy. How anyone could say that all Chinese look alike defeats me. A single ride on the Beijing metro would give the lie to that notion. We have seen perhaps five beggars over an entire weekend in a capital city. In London you can see that many during a half hour lunch break. Now here is a difference between Beijing and London: In London the very many beggars are almost invariably able-bodied white Anglo-Saxon men under 40. In Beijing the beggars are at a different level of misfortune, perceived or otherwise: the few we saw were blind, or missing half a face, or with arms or legs missing. We were told a story of a beggar seen recently in a night-club who had neither arms nor legs. Compared to that, the able-bodied men trying to sell the Big Issue on Victoria Street in SW1 cut no ice at all. I know of only one country with more closed-circuit TV cameras than China. That country is the United Kingdom. The uniformed police in Beijing seemed polite and smart, but they were quite literally everywhere. There were coppers on foot, in cars, and in mobile police stations all over the place. You might have to work quite hard in Beijing to be more than a mile or so from a uniformed policemen – and of plainclothesmen and secret policemen, of course, we know nothing. The one thing that remained in our minds and hearts was the generosity and hospitality of Emma’s host family. This couple welcomed us into their home for dinner on the Friday night, serving wine and spirits too, and they took us out for snacks on the Sunday evening, refusing to let us pay even for the taxi. Only by great effort and persistence were we able to press money on them as a contribution to the snack evening. We were in their debt. This was “inclusiveness” as one of the four aspects of “Beijing Spirit” that we saw advertised all over the city. The other three aspects were patriotism, innovation, and virtue. After the snacks I returned to the hostel alone, whilst the girls had their nails done. When they returned, not long after a welcome thunderstorm, they bore a further gift for me from mine host – some binoculars. What am I to do in the face of this kind of open-handedness? The answer comes back from all around and from the Man Above: “go thou and do likewise!” You might think that in a city of 23 millions in a Confucian culture, that the individual does not matter – but you’d be quite wrong. For two individuals, one couple, one family, made such a difference that my impression of this great city of 23 millions is brightened and burnished forever.